Find your cover from the list below, then choose your Item number in the 'Drop Down List'. 2) - With 3 Straps and "D" Rings for Locking the cover to the piano. 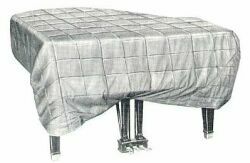 and the piano may be subject to scratches or bumps. Useful in Schools, Studios, Theatres, Concert Halls, Churches, Hotels. Constructed of heavy duty black close-weave duck, and padded with a NEW cotton filling. No Jute is used! The cover is flannel lined and quilted in a 4" diamond pattern with nylon Thread. This fabric is not commercially sold, but made exclusively to the specifications of our manufacturer.